To become a Young ICCA Member, click here to be directed to the Young ICCA membership application. Other recent developments in the area of international arbitration, such as opening of a new arbitral institution. Absent such recent developments in the applicant’s home jurisdiction, applicants may detail their passion for the study and practice of international arbitration in their written essay. 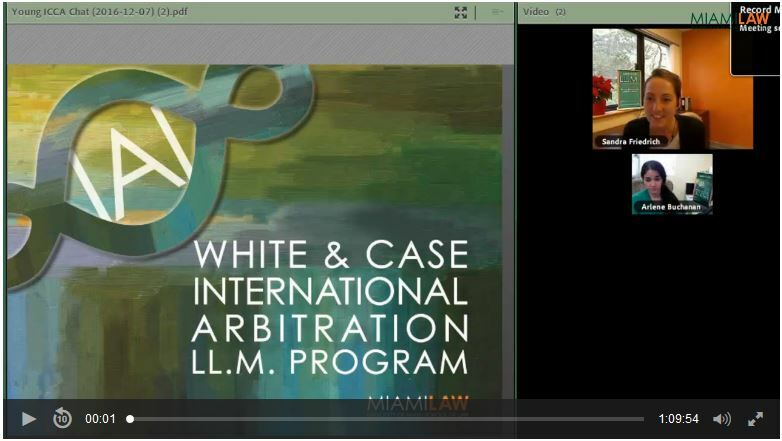 View a virtual chat video with White & Case International Arbitration LL.M. Director Sandra Friedrich to learn more about the program and this remarkable scholarship opportunity. Click on the following link to view: International Arbitration LL.M. and Young ICCA Scholarship Web Chat Video. Applicants must submit their written essay via email to International Arbitration LL.M. Program Coordinator Arlene Buchanan at abuchanan@law.miami.edu, and should include “Young ICCA Scholarship” in the subject line of their email. Only applicants who submitted a complete online application for admission to the International Arbitration LL.M. Program, with the required $50 program application fee, by the February 15 deadline will be considered for the Young ICCA Scholarship. Applications for admission and other scholarships will be considered on a rolling basis, with a priority deadline of February 15. Interested students are encouraged to apply even after the priority deadline of February 15. Applications for admission are accepted up until the beginning of the program studies in August and January, and scholarships may still be available at a later time (other than the Young ICCA Scholarship). Italian native Davide Schiavetti was named the 2015-2016 Young ICCA Scholarship winner. Ukrainian Liliia Lemchenko was named the 2014-2015 Miami Law/Young ICCA Scholar. The winner of the Miami Law/Young ICCA scholarship award FOR 2013-14 was Eric van Eyken of Canada. The winner of the 2012-2013 Miami Law/Young ICCA scholarship award was Wamiq Chowdhury.